I prefer when businesses and employees are able to work together to ensure both parties succeed. Businesses want reliable, hardworking employees, and employees want consistent, fair work schedules. While scheduling flexibility is critical to operating successful businesses, it is also important for employees to be able arrange their lives around work, child care, health appointments, and other parts of life. In the case of Senate Bill 828, Oregon has taken a step towards ensuring that employees in the food, hospitality, and retail sectors have more information about their schedule so they can better plan their lives. I supported this bill out of an effort to create positive compromise that would protect small businesses and prevent over-regulation or a patchwork of local scheduling regulations. Check out the KTVZ story on the bill here or below. The 2017-2019 education budget recently passed the Oregon Senate and is awaiting approval in the House. I am a big proponent of fully funding schools and investing in our children because it is critical to our future as a state. We need well-educated and trained citizens in order to attract family-wage job creators. However, I made a commitment to voters in Senate District 27 that I would not support anything less than $8.4 billion for schools. Our school districts are being squeezed on many sides by cost drivers like PERS and healthcare as well as climbing enrollment. This is why I voted against Senate Bill 5517 because the budget is simply inadequate and will result in cuts that will further undermine the quality of Oregon’s education system. 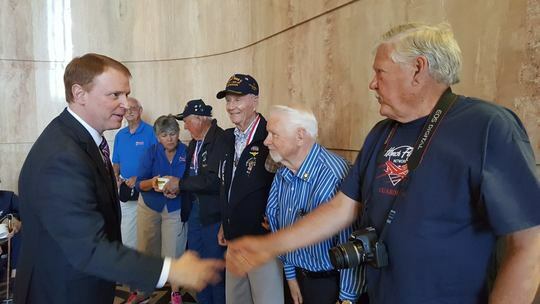 I was privileged to meet with these legendary World War II heroes from Bend last week. Thank you for your bravery and service to our nation in one of our greatest hours of need. In order to fix a problem that everyone saw coming, the majority party has opted for more taxes on health care providers and insurance premiums to pay for continued Medicaid coverage. The legislation, House Bill 2391, will likely result in higher healthcare costs while not addressing egregious systemic spending issues. The real winners will be the state and health care providers who will get more federal matching dollars for providing no more services than before. I voted against this tax because we have record revenue this biennium and the tax burden will fall on those least able to pay. I support coverage for the expansion population but this bill was not a good policy way to achieve that coverage. 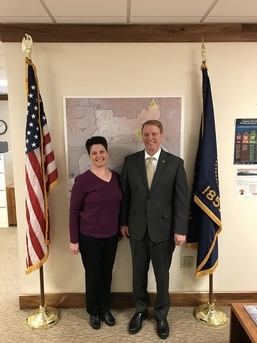 I always enjoy learning from passionate constituents like Bonnie Walker. Bonnie was in Salem advocating for Intellectual and Developmental Disabilities services. While investigations have been going on for some time, The Oregonian published an article this week about bribery happening at the Department of Energy. An ex-official of ODOE admitted to taking nearly $300,000 in bribes related to the sale of state energy tax credits. The bribes were compensation for special treatment and reduced scrutiny over tens of millions of dollars in energy tax credits. The Business Energy Tax Credit program was curtailed in recent years and the Department of Energy has been undergoing restructuring due to significant structural problems beyond the lack of accountability. 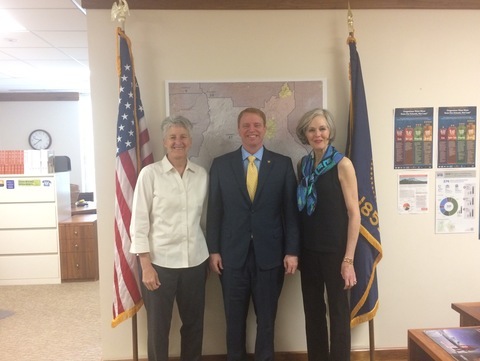 Great to meet with Becky Johnson and Amy Tykeson with OSU Cascades. It's always good to work with constituents from Central Oregon!